Enjoy the top 1 famous quotes, sayings and quotations by Aditya Chakrabortty. “Economics ought to be a magpie discipline, taking in philosophy, history and politics. But heterodox approaches have long since been banished from most faculties, claims Tony Lawson. In the 1970s, when he started teaching at Cambridge, the economics faculty still boasted legends such as Nicky Kaldor and Joan Robinson. "There were big debates, and students would study politics, the history of economic thought." And now? "Nothing. No debates, no politics or history of economic thought and the courses are nearly all maths." Economics ought to be a magpie discipline, taking in philosophy, history and politics. But heterodox approaches have long since been banished from most faculties, claims Tony Lawson. In the 1970s, when he started teaching at Cambridge, the economics faculty still boasted legends such as Nicky Kaldor and Joan Robinson. "There were big debates, and students would study politics, the history of economic thought." And now? "Nothing. No debates, no politics or history of economic thought and the courses are nearly all maths." How do elites remain in charge? If the tale of the economists is any guide, by clearing out the opposition and then blocking their ears to reality. The result is the one we're all paying for. Want to see more pictures of Aditya Chakrabortty quotes? 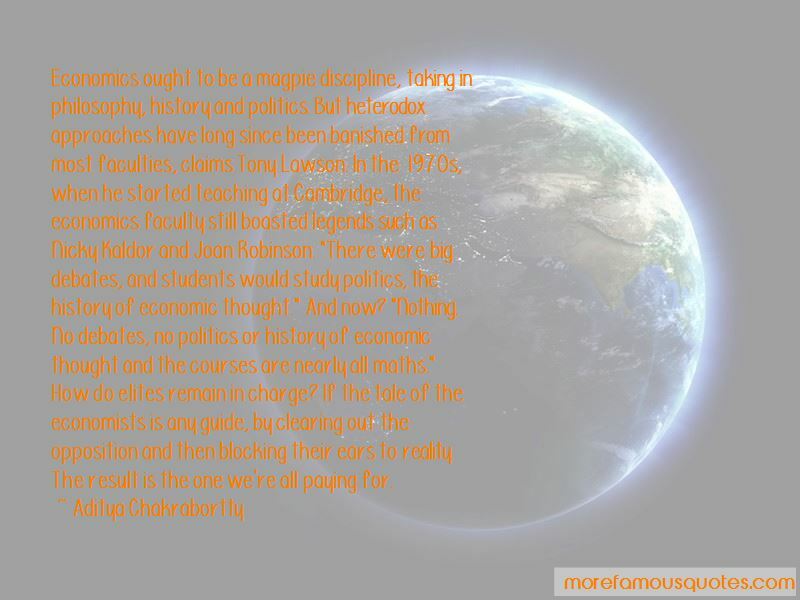 Click on image of Aditya Chakrabortty quotes to view full size.